After two years of growing and learning in practice as a Naturopath Doctor (health and wellness coach), Kim has revamped her class. We’re seeing God do amazing things in the lives of so many! There are simple foundations we all need to understand and there are fundamental things about how our bodies were designed that we should all know. This class is like getting six hours of private consultation/health coaching for the price of one. If you end up wanting more so you can dig deeper into the root cause behind what might ail you, you will have saved a considerable amount of your time and resources learning how to improve on the deepest levels. Addressing foundations alone is often all that is needed. So we’ve encapsulated the foundations of Kim’s Naturopathic education and practice into a day of intense learning, seeing, tasting, and doing. Participants walk away equipped with the knowledge to build ultimate and abundant wellness for themselves and their loved ones. Register: Pre-register for $75 each. $90 at the door. Included in the day, will be an abundant array of foods and drinks to sample. A new book available for purchase. Join us for a wonderful packed day of learning which will equip and empower you to “be your own doctor”. -Understand the physiology of your body and how to support and take care of it for strength and wellness. -Lose weight and keep it off. For real. No gimmicks. No powder or pill. Just lifestyle and root cause support! -Understand how the body is designed and what it is trying to do. Work with it to heal and thrive instead of stuffing symptoms and making them extreme. -Transform meals into medicinal nutrient dense super-food body and energy building deliciousness. In the Greek the word “doctor” means teacher. That is what Kim loves to do. Teach. Those who have invested in and taught her have changed and blessed her life and she loves blessing others with the truths about bodies, health, and wellness so that God’s people can rise up and serve Him in all the health and strength they were designed to enjoy! February was a month of many seasons we had some beautiful warm and sunny days and lots of rainy or cold cloudy days. On a cold, rainy day at around seven o’clock pm, we got a call that we needed to go check on some of the cows at one of the rental farms. So, several of the team loaded up and headed out into the foggy night in our good old farm truck. Once we got to the property, we switched it into four-wheel drive and went off-road. The truck tires are “old” and “smooth”, almost immediately the truck started to slide back and forth as we slowly moved forward along the little dirt (mud) road between two cattle fences. Several times the truck almost slammed into the fence posts along the way. With the gate in sight the truck mugged to a halt it was inches from the fence on one side and inches deep in mud. I climbed out opened the gate and said a prayer for safety. After a little situating the truck roared up out of the muddy road, through the gate and into the field. We all breathed a sigh of relief and laden with hay and supplements proceeded to treat the cows. We were all grateful to get home safely and out of the muggy rain! Heating milk to feed calves, every morning! Some of the family took a trip to PA to share about nutrition at a conference. We had our Annual Farm and Family planning meeting in the end of January. It is always a great time of sharing and reviewing. We are hoping that we can implement some of the new things discussed and praying for a fruitful 2019! January was full of Snow, ice, and frost! Welcome to the world little calf! Below is a true story written by Farm Boy Danny. One day Bill was working with his big brother Bob at a rental farm. They had been moving the cows into their field and finally had finished. They now needed to pump water out of a pond into a big yellow tank on a trailer. So bill got on the trailer and had to hold the hose that was coming from the pump while Bob pumped. There was a smaller trough next to it, so when he was done filling up the yellow tank, he moved the hose to the small trough but the hose couldn’t reach far enough. So Bill moved one step more only to slip and fall head first. Thankfully his boot got snagged on a nail and he was dangling in the air of the side of the trailer. Bob came over and un-snagged him and set him on the ground and they got in the truck and went to their house. Product of the Month and more! Happy New Year and Blessings on 2019! Like slim jims or jerky but without all the bad stuff! 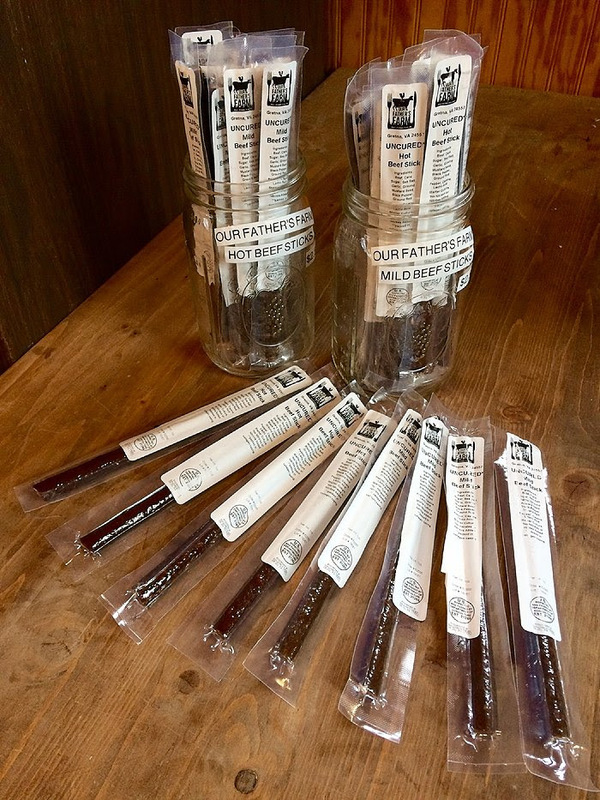 Our Father’s Farm beef sticks were introduced last year, since then they have been hard to keep in stock. We absolutely love them anytime and in any place. They are the perfect snack and best of all they are healthy! Herd Shares available. Contact us! Get Our Father’s Farm products delivered directly to your door! We are excited to be starting door to door deliveries in certain areas. Steaks: T-bone, Rib-eye, Sirloin, Tenderloin. We have 45 pound Beef Shares Available! Reservations are open for 2019! The best way to get your chicken from OFF. We have Great Pyrenees Livestock Guardian puppies available! Click here for more details. Reserve your chicken for the upcoming year! We ask for a $5 deposit per bird that will be deducted from your total. You can also request your chicken to be cut up for a small additional fee. How often would you like them delivered and where? Pasture-raised, truly free-range, happy, healthy turkeys. Fed Organic Feed: Click here to read why we made the jump to organic. Non-Soy and No GMO and NO glyphosate! Leftover bones make Delicious bone broth! Pay the $50 reservation by check, Credit card (by phone), or paypal (on our website prices page). Click here to reserve your turkey! Sold by the piece or get the economy family pack! Reserve a 45lb share! 6th Annual Field Day and Celebrating 10 Years of Farming! and Celebrating 10 years of farming! Farm Tour Schedule: 1st tour at 11:00 am the 2nd tour at 2:00 pm. See, touch, and learn about the workings of a truly natural farm and meet your farmers and the animals they raise! We will offer 2 farm tours during the day. The first tour will be at 11:00 and the second will be held at 2:00. You will see and learn about the milk cows, calves, chicks, broiler chickens, laying hens, the horse, dogs, puppies, cats and kittens! We will have an area as soon as you get to the farm where you can visit, pet, hold, and enjoy the animals while shopping or waiting for a farm tour! There will be, baby calves, baby chicks, cats & kittens, dogs, PUPPIES, a horse, and more! Purchase your herd share for Raw Milk at the Field Day and get it HALF OFF! To Purchase 1 Herd Share (which is one gallon of milk weekly) is usually$100. and after purchasing the herd share you can have a sample of the other dairy products we provide! Yogurt, Kefir, Cream, Butter, and Ice-cream. The store will be open! 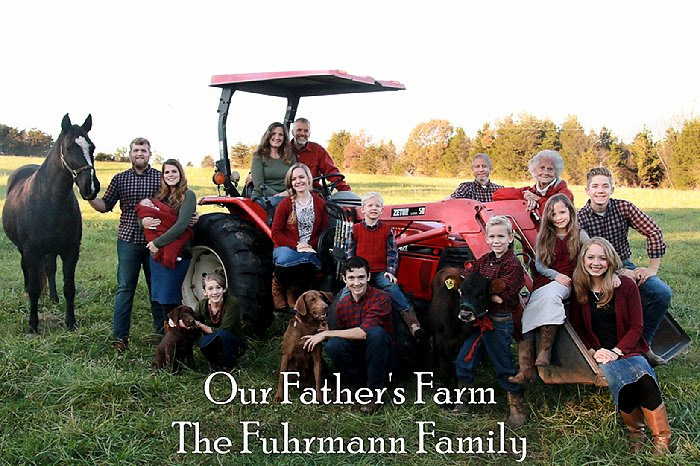 Plenty of grass fed beef, fresh herb mixes for grilling and cooking (family favorites), kombucha, organic juices, raw milk cheeses from a small, certified organic, Amish dairy farm. We will be stocked with our usual variety of other items: beauty lotion, healing salves, supplements, superfoods, Apple Cider Vinegar etc. There will also be a BAKE SALE offering all different kinds of bread, cookies, rolls, and more! Plenty of goodies to make a picnic out of or take home for later Or bring a picnic and enjoy it on the grounds. We will have samples of milk, ice-cream, and more! We will be drawing names for special prizes before each tour! Click here for complete recipe & more great ingredients to add! Click here to view full list of details. Raw Milk Herd Shares Available. Below products for herd share owners only. The healthy substitute for cream cheese. It is perfect for on breads, in veggie dips, sweet spreads, and more! 4 Beautiful, Healthy, Puppies Available! We still have four beautiful, healthy, and happy puppies available. Puppy #1 Chocolate Male (Available) This puppy has a more calm and gentle demeanor, he shows the strong and beautiful traits of an English lab and would be a perfect hunter or companion! He loves children. Puppy #2 Black Female (Available) This puppy has a perfect mixture of calm and energy. She is so sweet and loving and does wonderfully with all ages! Puppy #9 Chocolate Male (Available) This puppy fulfills the roll of a classic lab! He loves to run, swim, and play tug a war. His adorable face matches his demeanor! Puppy #12 Black Female (Available) This puppies energy is abounding. She runs, loves to play catch, tug a war, and wrestle. Her demeanor is happy, energetic, and sweet! She shows the hunting dog spirit and would be a wonderful companion to young and old! Though the harvest on the farm has slowed down the farmers are keeping busy! ;-) Fencing in our entire property (100+ acres) has been a big job but we (and, ahem, hopefully the neighbors 🙂 are enjoying the benefits of secure pens for the cows. It is getting to be less often that when the phone rings we don’t all yell “cows are out!” and head for our shoes before even answering 😉 that used to be quite common at our house. We are grateful for kind neighbors but everyone is much happier with secure perimeters! Friday we got 12,000 pounds of Chaff Haye delivered. Several of us went over to unload it from the 18 wheeler into our truck and flatbed and then into our storage area. Flowers blooming and new life on the farm are sure reminders that spring is almost here! Pounding in posts for new fence lines. Beautiful sunset on the way back from collecting eggs. Bringing the cows down for morning milking in the snow. Enjoy a wonderful day of learning! learn how your body was designed and how you can best care for yourself and for those you love. -Hands on work in the kitchen… and much more. Cost $65 which includes, the day-long seminar, a booklet of information and recipes you will learn about during the class, a brief farm tour and a lunch made from delicious natural foods from the farm so you can taste what you’ll be learning about. “I loved hearing Kim’s journey to healthy eating- it is empowering & filled with encouragement. I walked away from the workshop with knowledge, motivation and the desire to take the time to provide & prepare my best to serve my family. I enjoyed the hands on time in the kitchen learning a new way to prepare healthy food. Our little store is Stocked. Click here to pay online for the class with paypall. Purchase your favorite meats and save! Winter & Holidays are just around the corner, stock up your freezers for the winter, and enjoy pasture raised beyond organic meats. We will not be raising chickens through the winter. Come out to the farm Saturday the 19th for our fall farm day and get an additional 5% off! Caution: we only have a limited amount of packages and tend to sell out quickly! Comes with our special recipe! – 1 super chicken broth pack. From Our Farm to Your Table! Our Father’s Farm 45 pound share just got better! SALE $9.75 $9.00 per pound. Only 2 shares still available so contact us soon! What is a 40 pound share and why should I purchase it? When you purchase a 40 pound share you get every cut of beef (roasts, steaks, ground beef and more) for only $9.00 per pound. This allows you to quickly stock your freezer with delicious and nutritious meats for a huge discount! We also have all cuts of beef available click here to view the full list.